The 47th Cannes Film Festival was held from 12 to 23 May 1994. The Palme d'Or went to the American film Pulp Fiction directed by Quentin Tarantino. Official poster of the 47th Cannes Film Festival, adapted from an original drawing by Federico Fellini. The festival opened with The Hudsucker Proxy, directed by Joel Coen and closed with Serial Mom, directed by John Waters. Jeanne Moreau was the mistress of ceremonies. ^ "Posters 1994". festival-cannes.fr. Archived from the original on 14 October 2013. ^ a b "Awards 1994: All Awards". festival-cannes.fr. Archived from the original on 12 October 2013. ^ a b c d e "Official Selection 1994: All the Selection". festival-cannes.fr. Archived from the original on 13 November 2013. ^ a b "47ème Festival International du Film - Cannes". cinema-francais.fr (in French). Retrieved 7 June 2017. 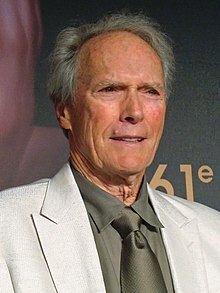 ^ "Cannes' conclusion gives Eastwood a break, American filmmakers accolades". Retrieved 24 May 2017. ^ Turan, Kenneth (24 May 1994). 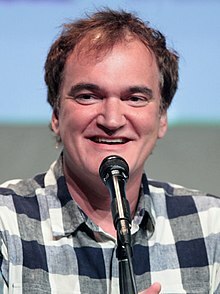 "Surprise Pick: 'Pulp Fiction' : Cannes report: Quentin Tarantino's film is the third movie about the underbelly of American life to win the Palme d'Or in the last six years". Los Angeles Times. Retrieved 24 May 2017. ^ Maslin, Janet (23 September 1994). "Film Festival Review: Pulp Fiction- Quentin Tarantino's Wild Ride On Life's Dangerous Road". The New York Times. Retrieved 24 May 2017. ^ "Fewer American films in Cannes competition". baltimoresun.com. Retrieved 24 May 2017. ^ Maslin, Janet (24 May 1994). "A Dark Comedy Wins at Cannes". The New York Times. Retrieved 24 May 2017. ^ "All Juries 1994". festival-cannes.fr. Archived from the original on 4 March 2016. ^ "33e Selecion de la Semaine de la Critique - 1994". archives.semainedelacritique.com. Retrieved 9 June 2017. ^ "Quinzaine 1994". quinzaine-realisateurs.com. Retrieved 7 June 2017. ^ "Anurag Kashyap: 'The perception of India cinema is changing'". Digital Spy. Retrieved 25 May 2017. ^ "Shekhar Kapur, exclusive interview". Festival de Cannes. Archived from the original on 28 September 2015. Retrieved 20 October 2015. ^ "1994 - Le Jury, Les Prix". cannes-fest.com (in French). Retrieved 7 June 2017. ^ "FIPRESCI Awards 1994". fipresci.org. Retrieved 27 June 2017. ^ "Jury Œcuménique 1994". cannes.juryoecumenique.org. Retrieved 27 June 2017. ^ a b "Cannes Film Festival Awards 1994". imdb.com. Retrieved 27 June 2017. Wikimedia Commons has media related to 1994 Cannes Film Festival.